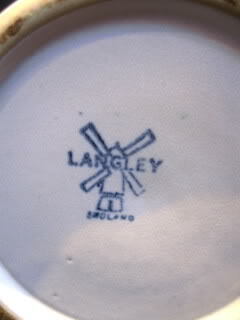 I'm a big fan of the Langley Pottery items that Glyn Colledge designed after the take over by Denby in the late 1950's. 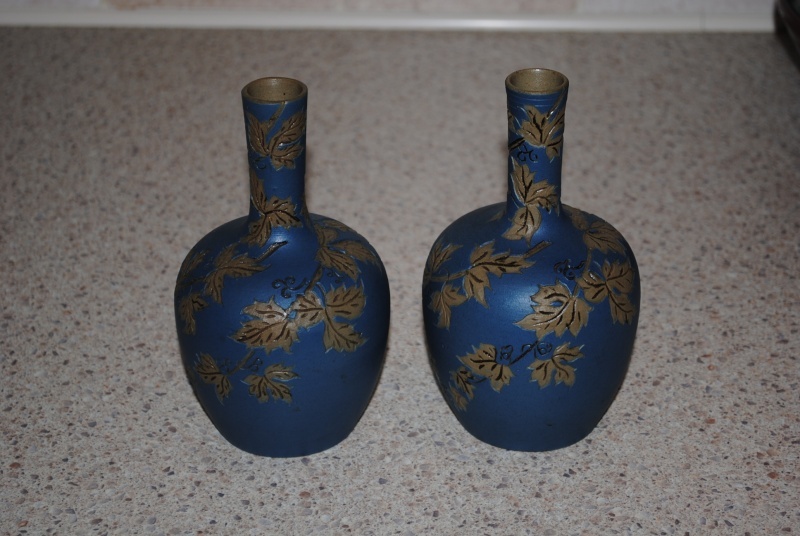 These three vases are all GC designs for Langley and date from the 1960s. Another nice Glyn Colledge design for Langley. Variation on a theme by Glyn Colledge; also love the contrasting dark grey interior. 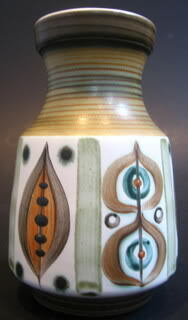 I met a lady yesterday who's mother was a friend of Glyn Colledge,she told me that the signed pieces ensure that Glyn had some part in the decorating of that piece,also that he was left handed and would hold the pottery up at head height when painting on the glazes,this may explain his rather erratic signature? 10" vase marked Lovatts England, I can find lovatt & lovatt and lovatt and Langley but not Lovatts on its own , any ideas of age etc. It's gotta be 30s or thereabouts looking at the colour and style, it's got a touch of the Wedgwood/Keith Murray about it too. Yes, I agree 1930's 40's , when did they start using made in england as opposed to just england ? 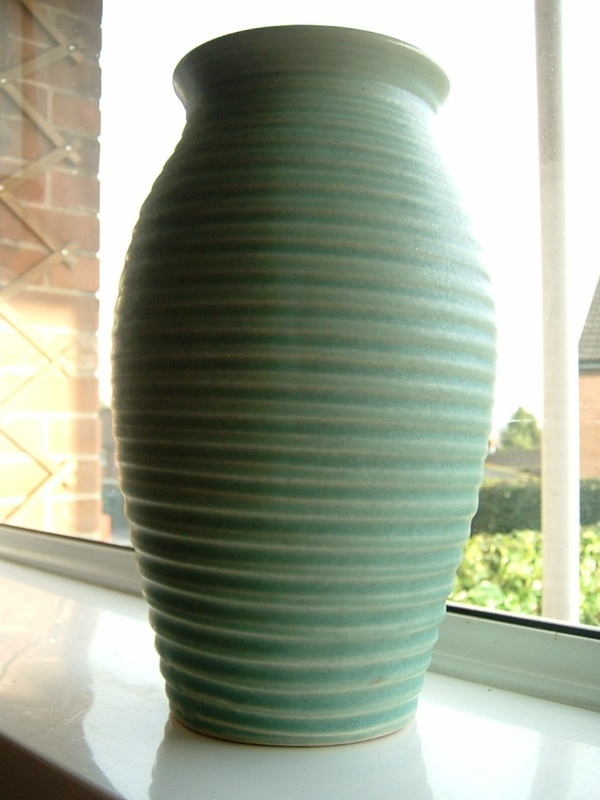 any ideas ,kath bought it in a junk shop this morning for £2, because she thought it looked murray-ish . I think it all ended up as Denby didn't it? 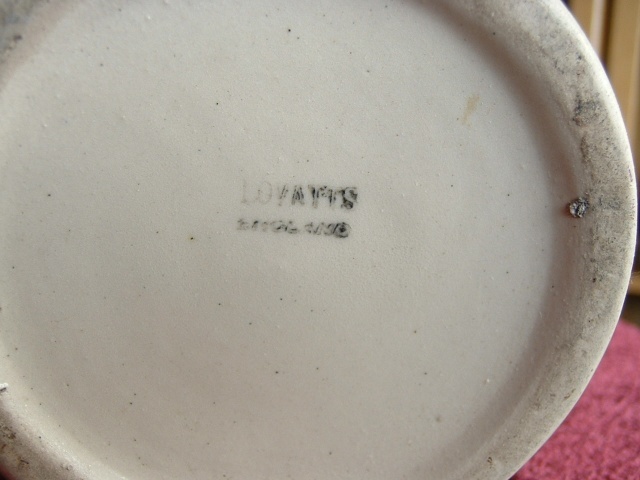 Thanks Dave, In 1959 Denby bought Lovatt & Lovatt, but the continued as an independent Co. ,but it's the begining I am looking for when it was just Lovatt. Lovatt & Lovatt, Langley Mill Nr Nottingham 1895+ retitled Lovatts Potteries Ltd in 1931, according to Godden. 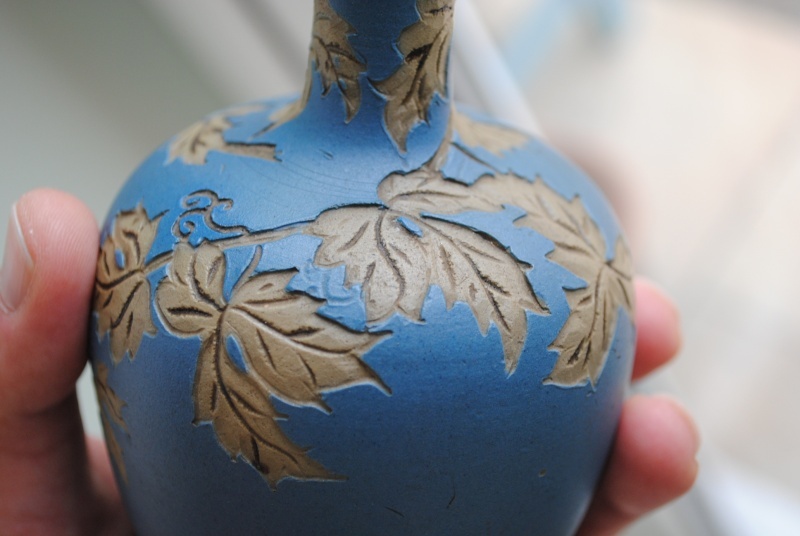 This looks very similar to Poole Sylvan Ware of the 1930's. Nice for a couple of quid! 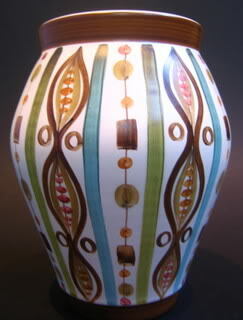 Stoneware Vase 8" tall. No marks, with remains of old label. 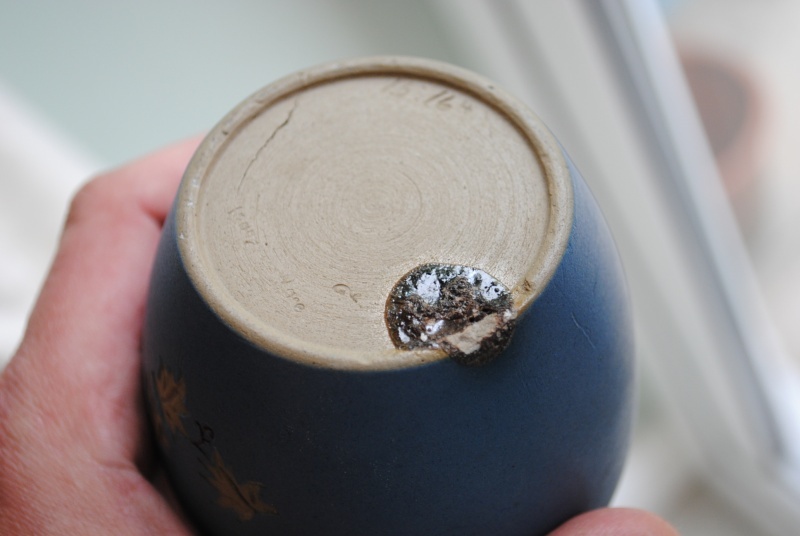 ID help please DENBY style tankard - Denby/Langley "Magnolia"
SP wins but I'm glad I wrote "possibly a touch earlier." Heavy stoneware lidded jar, maybe for tobacco, with vivid blue glazed ground and geometric art deco frieze design. 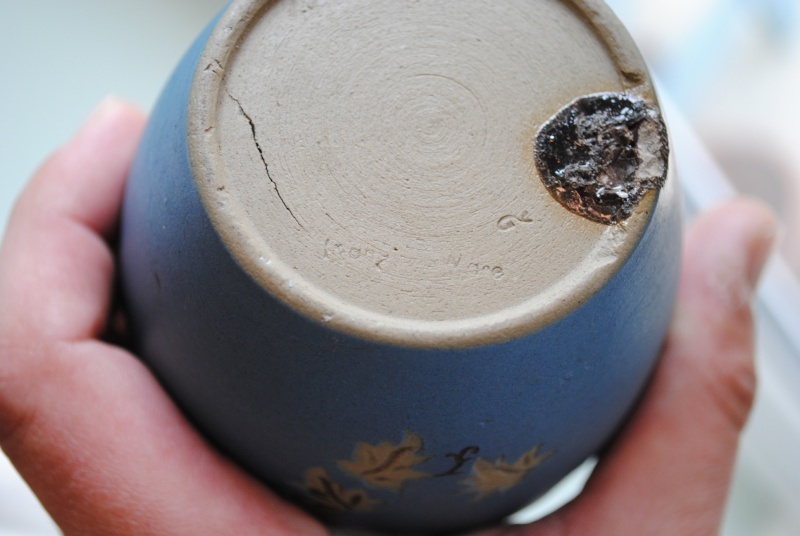 Printed and impressed Made in England marks to base - no other identifying pottery mark that I can see...A mystery! Pip wrote: I'm a big fan of the Langley Pottery items that Glyn Colledge designed after the take over by Denby in the late 1950's. 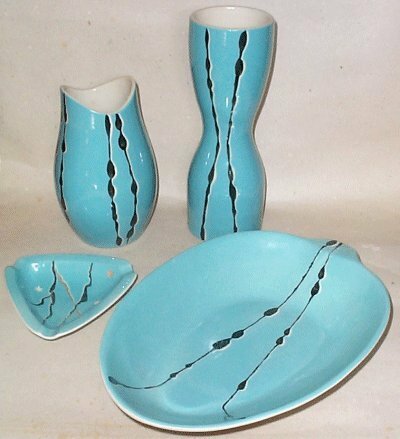 These three vases are all GC designs for Langley and date from the 1960s. This range was called Minstrel. short stay at the Langley mill pottery just before he moved on to Poole pottery. The decoration was by Edward Campden.. Known as "Windsor green" Introduced in 1937, but made during the 50s. Also there are blue, yellow and shiny versions. That mark was used c1940-1950.